There are a wide variety of online counseling programs available, and figuring out which is best for you can be a daunting task. We have reviewed and summarized the top 40+ Master of Counseling Programs available. We reviewed their typical courses, their accreditation, and wrote a summary of the program. You can use this list as a starting point for narrowing down which schools might be best for you. Remember, you need to talk to the admissions staff at the school to fully comprehend the program's intricacies. Every program is different. Looking into multiple programs might serve you well in figuring out the differences, pro's, and con's. Read on to view the entire list of schools with Online Master's of Counseling programs. A comprehensive summary and write up of the program along with where you can learn more information. Online Option: Yes. All classes are available online. Admissions Notes: Bachelor’s degree required with certain GPA restrictions. No GRE required for admissions. 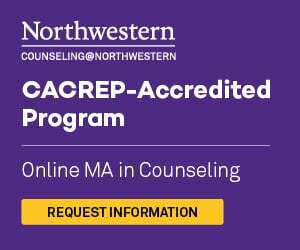 Northwestern University currently offers an innovative counseling program that offers a specialization in Child and Adolescent Counseling. This program requires that students take part in 2 – 2.5 years of graduate level studies to gain expertise in this field. Students that become involved in this program may gain the skills needed to work effectively with youth that are dealing with mental illness or generalized issues associated with their normal development. This program is currently CACREP-accredited, making it a reliable choice for pursuing licensure in your future. The curriculum is focused on educating students about the different theories and applications that are relevant to their field of expertise. As part of this program, students may be required to take part in supervised work experiences that are required for individual state licensure. Admissions Notes: Bachelor’s degree required with certain GPA restrictions. GRE scores not required for admission. NYU – Steinhardt has a Master of Counseling program that can fit the needs of most upcoming counseling professionals. Through this university’s programs, students can learn how to become effective and helpful counselors. The diverse curriculum and in-person experience requirement can contribute to how much knowledge you gain throughout your experience. This degree program can take a little over 21 months to complete and offers students the option of choosing specializations in School Counseling or Mental Health Counseling. Depending on which concentration you choose, your curriculum may vary. This program requires 100 hours of practicum experience and 600 hours of internship experience. Online Option: Yes. All classes are available online. 2 on-campus immersions required. Admissions Notes: Bachelor’s degree required with certain GPA restrictions. GRE or equivalent required in previous 5 years. Students that enroll in the Master of Education with School Counseling program at Vanderbilt University can gain a new understanding of counseling from the educational perspective. The purpose of educational programs such as this one is to provide future educational experts with the skills necessary to support school-aged children throughout their personal and educational development. This program requires students to complete 48 credit hours, 2 on-campus experiences, and a 1 year internship at an approved educational facility. The program includes topics such as education research, advanced counseling techniques, social and behavioral science, and sociology. Students that complete this program can potentially play a role in the improvement of school support systems for children in need. Online Option: Yes. All classes are 100% online. Admissions Notes: Bachelor’s degree required with certain GPA restrictions. GRE scores are not required. The online Master’s in Education at Mizzou Online is a great way for professionals to become a helpful part of counseling and the field of education. This program can provide students with specialization in mental health practices in schools, which is an important aspect to consider in youth development. People that are interested in this program can indulge in what it has to offer without having to make campus visits throughout their experience. Students that complete this program can pursue careers in special education, guidance counseling, teaching, and even educational administration. The curriculum for this program includes those that focus specifically on teaching, as well as those that are more focused on the counseling aspects of the field of education. Bradley University is a great school that calls upon future counseling professionals to enter into their programs. Students have the option of pursuing a Master of Arts in Counseling in 2 areas: Clinical Mental Health Counseling and Professional School Counseling. Each program has its own individual curriculum that includes courses relevant to the duties and responsibilities of each field. These educational programs were built to help students pursue licensure after graduation, making them an excellent choice for dedicated professionals that wish to work one-on-one with clients in the field. Students may be required to take part in a supervised work experience requirements prior to being approved for licensure within their state. This university is a great option for students that are looking for a good quality education without the hassle of attending classes in person. Texas A & M University has long been a reputable school for students within all disciplines. If you are interested in enrolling in this program, you can gain preference by having some experience in a classroom setting. Although not a mandatory requirement, students with this experience may be preferred. The Master’s in Educational Psychology with emphasis in School Counseling can provide students with a well-rounded experience that can lead to exciting endeavors in the field. The curriculum for this course includes courses that are related to the psychology of development, as well as the educational techniques that have been proven effective in the field. Students may also be required to engage in practicum experiences as part of their program. The University of Tennessee at Martin can allow students to complete their Master’s in Counseling within 2 to 3 years for most students. This reputable school current offers online degree in School Counseling and Clinical Mental Health Counseling. There is also a School Counseling Endorsement for interested students to include with related master’s degree programs. The Clinical Mental Health Counseling major through this school consists of 63 credit hours. This program can be completed in 2.5 to 3 years on average. The School Counseling specialty consists of a 48 credit hour requirement and can be completed in around 2 years on average. Both programs require that students take part in a supervised work experience before graduating and becoming licensed in their area. Online Option: Hybrid. Half of courses are online. Length of Program: 3 years, including internship. Oregon State University is a reputable school that offers many different master’s programs to interested learners. The counseling programs at this school can help students to become more knowledgeable in relevant fields such as Psychology, Sociology, and Education. The Master’s in Counseling at this university also allows students to choose a School Counseling specialization, which is great for students that wish to give back to the field of education. The curriculum at this university consists of 75 credit hours, with courses including Leadership in Counseling, Crisis and Grief Counseling, and Addiction Behaviors and Support. These courses can help to provide widespread information on the different types of people that may be seen in a counseling setting, which can contribute to better knowledge and professionalism in the field. Wake Forest University is a well-known university that contains an incredibly high pass-rate for enrolled students. This university has a great foundation of teacher support, which can help you progress through higher level master’s programs in a successful way. The Master’s of Counseling at the schools contains specializations in both Mental Health Counseling and School Counseling, which is great for learners that are interested in working in 2 of the largest areas of counseling available. Depending on which program you choose, you may find that your experience varies in terms of what courses you take and how long you are enrolled. Students that enter into either of these specializations may be required to spend some time working in the field, in order to get the best possible experience before being licensed to practice within their state. Online Option: Yes. All classes are available online. 4 in-person visits are required over the course of the progress. This college offers a Master’s in Counseling for students that are interested in working for school systems within their state. The Master of Counseling with emphasis in K-12 School Counseling at this university consists of 50 credit hours that include coursework that is specific to individual counseling and those that focus more on the counseling of youth. Educational topics and techniques may also be a large part of the curriculum at this school. In addition to online meetings and coursework, students may be required to be present in-person 4 times during their degree experience. Each appearance includes a 4-day campus visit in which students work with instructors on various projects and counseling assignments. One benefit to attending this school is the implementation of in-state tuition for students regardless of where they live. Admissions Notes: Bachelor’s degree required with certain GPA restrictions. GRE not required for admission. USC is a great university that is relied upon by thousands of students each year. If you desire a career working in education, but want a specialization other than teaching, the Master’s in Education with specialization in School Counseling may be the right program for you. Instructors at this university can deliver a relevant curriculum over the course of 5 semesters that can help you achieve this goal. The coursework included in this program may be The Counseling Process, Cross Cultural Counseling, Human Development, and Learning and Individual Differences. This school blends different aspects of personal counseling to those in education to give you the best blend of knowledge for your future careers. This program can be completed in around 2 years on average. Online Option: Yes. All classes are available online. 15 week practicum required in-person and 2 5-day residencies. Lamar University can provide students with a Master of Education in School Counseling degree in a little under 2 years. This innovative programs consists of online learning, in-person residencies, and a practicum requirement. Each of these items come together to make for a great experience for students that want to show their skills in school systems within their state. The curriculum for this program includes 48 credit hours, and has courses such as Intro to School Counseling, Group Counseling, and Multicultural Counseling. Each of these courses provides unique skills for counselors, most of which are important for providing good quality care in the school system. Most students that enroll in this program can choose their own practicum setting, which can help to ease the process for busy learners. The Master’s in Mental Health Counseling at SNHU is a great way for students to become involved in a degree program that can teach more about the important aspects of mental health counseling. This program in particular consists of 60 credit hours, which can be completed over the course of 2 to 3 years. Most students enjoy the diversity in learning and flexibility of this program, since it can be completed online. In addition to the standard curriculum requirement, this program may also require students to take part in 2 face-to-face residencies on campus, which can help strengthen skills in in-person practice. After completing course requirements, students may also be required to engage in a 100 hour practicum and a 600 hour internship. The Master’s in Clinical Mental Health Counseling at Walden University is an accredited degree program that can allow students to choose from many diverse paths. Accredited specializations for this program include Addiction Counseling, Career Counseling, Forensic Counseling, Military Families and Culture, and Trauma and Crisis Counseling. Other Master’s programs in Counseling at this school include the Master’s in Marriage and Family Counseling and the Master’s in School Counseling. The curriculum for this degree program may vary slightly depending on which specialization you choose. You can expect to take courses that are relevant to your concentration, in addition to core courses required for all counseling disciplines. In addition to the coursework that you are expected to complete, you may also be required to take part in a practicum and supervised field work before having the ability to graduate. Online Option: Yes. All classes are available online. Field experience and practicum may be required. The 39 credit hour Master of School Counseling program at UT Tyler is a great option for students that want to be an important part of the field of education. This degree program is helpful in guiding learners to careers that can offer unending support to students within different school systems, and guidance to students throughout the educational process. In comparison to similar programs, this master’s program can allow students to graduate in as little 18 months. Students that are enrolled in this program may be required to take part in a practicum experience, as well as some supervised field work. These requirements are put into place in order to provide students with in-person experience that can help them to become more effective counseling professionals. Online Option: Yes. All classes are available online. Field work and practicum requirements are conducted in-person. Bellevue’s Master of Science in Clinical Counseling is a degree program that can set students on track for licensure in their immediate future. This program currently has a 60 credit hour requirement, which can be completed over the course of 2 to 3 years, depending on enrollment. The curriculum for this program may include courses such as Human Development Over the Lifespan, Ethics in Counseling, Counseling Theories, and Social Diversity. In addition to the curriculum, students may be expected to engage in 100 hours during their practicum and 600 hours during their internship. These experiences are conducted in person, under the direct supervision of a licensed counselor. These experiences can help shape future counselors into helpful professionals within their field. Online Option: Yes. All classes are available online. A practicum and internship is required during the program. The online Master of Arts in Professional Counseling degree program at Liberty University is an excellent option for students that are looking for a great quality program for their future. This program provides what students need to pursue licensure after graduation, which makes this an even more sought after program for upcoming counseling professionals. Students that enroll in this program can take part in a curriculum that contains some of the most common and popular aspects of professional counseling. Coursework for this program includes courses such as Marriage and Family Counseling, Clinical Diagnosis & Treatment Planning, and Crisis Counseling. These courses can help shape professional counselors throughout their experience at this university. Online Option: Yes. All classes are available online. Supervised work experience required. Colorado Christian University current provides an online Master of Arts in Counseling to students that are interested in pursuing licensure in their future. This program consists of 60 credit hours and consists of coursework that pertains to the care of individuals within a clinical setting. Students that enroll in this program may also take part in a supervised practicum and internship which can help further their knowledge in the field. The curriculum for this program includes 39 credit hours of core counseling courses, 4 credit hours of bible and theology, 9 hours of practicum, a 4 credit hour residency, and 4 credit hours of electives. Each of these components is relevant in helping students to learn more about their career path while integrating hands on experience and course room research. The 60 credit hour Master of Arts in Clinical Mental Health Counseling at Grace College is a great degree program for students that want to play a role in the improvement of mental health for all people. This program is conducted completely online, with only residency requirements conducted in person. Students that have different tastes in course distribution may also be pleased by the layout of this university. Grace College allows students to choose from 6, 7, or 8 semester programs. This can allow students to take courses at their own pace and finish the program within a time frame that is comfortable for them. The flexibility of this program alongside the online option can make this a great degree advancement program for busy working individuals and those that prefer the most convenience with their education. There are diverse degree options for interested students at the University of the Cumberlands. Students can choose from the Master of Arts in Professional Counseling, the online Master’s in Clinical Mental Health Counseling, and the online Master’s in Addiction Counseling. Each of these programs is CACREP accredited and can provide students with what they need to become helpful professionals in the field. Students that are interested in any of these programs may be pleased to find out that they consist of 60-66 credit hours respectively. Like most other reputable counseling programs, students may also be required to take part in a supervised practicum and internship before becoming licensed, to ensure that they are ready to work with clients in the field. Admissions Notes: Bachelor’s degree required with certain GPA restrictions. No GRE required for admission. Students that desire influence in the field of education are great qualifiers for the Master of Science in Education – Counseling program at Concordia University. This program has elements that are relevant to advancement in the field of education, as well as those that can contribute to support for students that are currently enrolled in the school system. This program in particular consists of 45-60 credit hours, which can be completed in around 2 years on average. This program may also require students to spend time working in a real-world environment, in order to test their knowledge of the program material before being released to work freely in the field. Students can also choose from different specializations such as School Counseling and Professional Counseling for their program. Online Option: Yes. All classes are available online. Practicum, internship, and colloquia required in person. Antioch University is a great school that offers a CACREP-accredited Master of Arts in Clinical Mental Health Counseling to upcoming students. This program has some in-person requirements that include a 2-week intensive colloquia, a semester long practicum, and a 3 semester internship. These requirements are common within counseling degree programs and can help increase skill and awareness in the field of mental health. Students can choose from different tracks when planning their degree program. This program in particular allows students to choose from Substance Abuse and Addictions, Military Family, and Trauma. The curriculum for this program can change to include aspects from each specialization, depending on which you choose for your individual program. Online Option: Yes. All classes are available online. Supervised internships and practicums may be required in-person. The Master of Arts in Counseling degree at Indiana Wesleyan University is a great way for students to become a part of the growing field of professional counseling. This university has several different paths for students to choose from, including Clinical Additions Counseling, Clinical Mental Health Counseling, Community Counseling, Marriage and Family Counseling, School Counseling, and Student Development Administration. Each of these programs can provide students with career options that are helpful to those in which they serve. This university has different enrollment options, which can allow students to engage in their programs at a full-time or part-time rate. Students that choose the full-time route can complete their program in around 2 years on average. Online Option: Yes. All classes are available online. Internship and practicum may be required in-person. The Master of Science in Mental Health Counseling program at the University of Massachusetts consists of a 60 credit hour requirement for students that are enrolled. This university has been providing reputable degrees to students for many years, making it a great place to settle into a graduate degree program. While in this program, students can engage in classroom studies and discussions pertaining to current counseling cases, while started supervision requirements within their first year. The course work that you may see in this program can reach into several different aspects of mental health counseling. Students can learn more about the different types of mental illnesses and disorders, so that they can provide the best quality of care to those that seek their assistance. Some varying aspects of counseling such as education and relationship dynamics may also be discussed. Messiah College is an amazing school that offers well-known degree programs to upcoming master’s level learners. This university has a Master of Arts in Counseling program that consists of different specialties for students that may be interested in pursuing diverse paths during their careers. The specializations offered by this school include Clinical Mental Health Counseling, School Counseling, and Marriage, Couple, and Family Counseling. Each specialization requires 30 credit hours in addition to the standard counseling core required of all programs. Depending on the type of enrollment you choose, you could finish your degree program in as little as 2 years, or stretch it out over the course of 4 to 5 years. The flexibility of online degree programs at this university can change the way that you see graduate education. Online Option: Yes. All classes are available online. Practicum and internship required in-person. The University of Louisiana at Monroe is a well-known and well-liked university that provides great quality educational programs for students all over the country. The online Master of Science in Counseling is currently available online, which can make achieving your goal of licensure even easier than once thought. This CACREP-accredited degree program can teach you more about this field and what is required to be an able professionals. There are currently 2 specializations offered by ULM: Clinical Mental Health Counseling and School Counseling. Each program has its own special place in the field of counseling, since both play a role in influencing vulnerable populations. The course work that you may see throughout either program can include diagnostic, treatment, and follow-up procedures that are required within the professional field. Online Option: Yes. All classes are available online. Residency may be required in-person. Regis College caters to the busy adult with their convenient online Master of Arts in Counseling. This program is currently accredited by the CACREP, making it a reliable option for pursuing licensure as a counselor in your future. The program is completely online, with a short residency requirement and flexible courses that can help you maintain a full-time job or keep up with your regular everyday responsibilities. The course work for this program may include Theories of Counseling Psychology, Psychopathology, and Clinical Assessment & Crisis Intervention. As you can see, the curriculum is focused on providing knowledgeable assessments to people that are having symptoms of mental health issues or ailments. The entire program can be completed in around 2.5 years for students that are enrolled full-time. Grand Canyon University is a convenient option for students that wish to pursue their counseling degrees in an online setting. This university currently has a few different options for students interested in master’s level counseling programs, including the MS in Professional Counseling, online Masters in Marriage and Family Counseling, Online Masters in Childhood and Adolescent Disorders, and MS in Counseling Trauma. Depending on your interests, there could be a program that is fitting for you. The curriculum of each program may vary since each of these specializations focus on different populations within society. GCU provides a common counseling core for all counseling programs and each specialization will add to this core. Most students can complete this program within 2 to 3 years. Online Option: Yes. All classes are available online. Intership or practicum may be required in person. Concordia University – Irvine offers an online Master of Arts in Counseling to upcoming students from all over the country. This outstanding school seeks to educate students further on the treatment of people that have been diagnosed with various mental health disorders and challenging circumstances, the diagnostic skills that are required of professionals in this realm, and the use of research in clinical decision making. The curriculum for this program may include courses such as Foundations of Addiction Counseling, Theory and Practice of Group Counseling, Human Growth and Development, and Career and Lifestyle Development. This well-rounded curriculum can help student better understand different methods for helping people with very different life situations and challenges. Online Option: Yes. All classes are available online. Internship and practicum may be required in person. Huntington University introduces students to their online Master of Arts in Counseling by providing them with a 3-day intensive located on-campus. This and other short experiences in-person can help students develop their skills in counseling in more platforms that just the online setting. This program allows students to learn more about the field of counseling, and how their knowledge can be transformed into help for others in need. The curriculum for this program may include courses such as Mental Health Counseling, Addictions Counseling, and Family Counseling. Depending on what type of careers students plan to pursue after graduation, these courses may be helpful in providing diagnostic cues and treatment ideas for people that are in need. This entire program can be completed in around 2.5 years. ASU-Colorado has a fascinating online Master of Arts in Counseling program for students seeking convenience and flexibility with their online degree programs. This program allows students to choose from 2 paths: Clinical Mental Health Counseling and School Counseling. In addition to attending courses online, students may be required to take part in week long intensives at various points throughout their program, to ensure that they are on track with the curriculum. The goal of this degree program through ASU is to help students learn more about their own personal philosophies on counseling and encourage personal growth. A deep dive into counseling research may also occur, to teach students more about the proven methods and tools available for their use. Students that are enrolled at a full-time rate can complete this 60 credit hour program in around 2 years. Online Option: Yes. All classes are available online. Practicum and internships may be required in person. Admissions Notes: Bachelor’s degree required with certain GPA restrictions. GRE not required for this program. SBU is a reputable university that has degree programs available to students in the online setting. The online Master of Science in Education in School Counseling is an accredited program that is great for students that have the desire to move forward into education-related positions after graduation. This program leans on the need for advanced research skills and personal growth for success, which is why students within this program are constantly encouraged to seek support from instructors and other learners. The curriculum for this program includes the integration of internships in a school environment, School Counseling courses, and courses that focus on the different types of methods of counseling. Students that graduate from this program and complete all supervision requirements may be eligible for licensure within their states. Students that currently have full-time jobs or other time-consuming responsibilities may find the online Master of Science in Counseling programs at Nova Southeastern University more than fulfilling. This flexible online program is currently offered with different specializations such as Clinical Mental Health Counseling, School Counseling, Substance Abuse Counseling, and Applied Behavior Analysis. Some of the coursework that students may see in this program may reflect their chosen specialties. Core coursework for the counseling program may include Human Growth and Development, Adult Psychopathology, Theories and Practice, and Research and Evaluation for Counselors. Students that attend this program full time may be able to complete it within 2 to 3 years depending on their specialty. Online Option: Yes. All classes are available online. Practicum and internship required. The University of West Alabama has a competitive online Master of Education in School Counseling for people that wish to become involved in the educational system, or for educators that are interested in becoming school counselors. This incredible program consists of 48 credit hours, which can be completed in as little as one year. For in-state students, this program can also result in the awarding of a teaching license in the state of Alabama. The course work for this program include core classes such as Group Counseling, Techniques of Counseling, and Diagnostic Techniques. The counseling curriculum may then be implemented during a required practicum and internship throughout the program. Incoming students that are interested in becoming a vital part of student success may find what they are looking for in this degree program. Online Option: Yes. All classes are available online. Internship and 2 weekend seminars required. The online Master of Education in School Counseling program at Salem College is an excellent resource for upcoming school counselors that want to learn the most about their field. This program can teach students about advocating for students under their care, providing needed assessments to students within an educational setting, and personal counseling techniques that can assist students with achieving their highest potential. In addition to the curriculum, this program consists of an internship requirement that must be completed before the end of the program. Students may also be required to participate in 2 weekend-long seminars to help sharpen their application of the curriculum. This in-depth program can be completed in around 36 months, making it a great option for those that desire quantity and quality with their education. Online Option: Yes. All classes are available online. Internship and practicum required. Online counseling programs at the Chicago School of Professional Psychology are high in both quality and substance. The Master’s in Clinical Mental Health Counseling program at this university can help students to learn more about the different types of mental illnesses and psychological disorders present in society and how to help people that have been diagnosed with them. Students enrolled in this program may be required to complete 100 hours of practicum throughout their experience, as well as 600 hours of clinical work experience under the supervision of a licensed counselor. The curriculum may include topics such as Diagnosis of Mental Health Issues, Assessment of Individuals, Group Theories, and Abnormal Psychology. The entire program can be completed in around 3 years at a part-time rate. Online Option: Yes. All classes are available online. Hybrid programs also available. Palo Alto provides diversity in the learning experience they promote to learners. The Master of Counseling programs at this school are offered in person, online, or in a convenient hybrid format for students that can attend some classes in person. For online learners, this university provides helpful online virtual sessions and supportive professors to assist in accommodating students to the online setting. There are currently 2 specializations at this university that are CACREP-accredited. Students can choose from either the Marriage, Family, and Child specialization or Clinical Mental Health. Regardless of which concentration you choose, you may be required to take part in an intership and supervised work experience prior to becoming licensed as a counselor. Depending on whether or not you are enrolled full-time, this program can be completed in 2 to 3 years. Online Option: Hybrid. About 85% of courses are online. 2 in-person training sessions required. Admissions Notes: Bachelor’s degree required with certain GPA restrictions. MAT or equivalent required in previous 5 years. The 61 credit hour Master of Science in Counseling program at Faulkner University can provide students with further education in the broad field of counseling. Students that are enrolled full-time can complete this program in around 2 years. Completion of this educational program can result in licensure in the state of Alabama, but students residing in others states must check with their licensing board to determine eligibility. While in this program, students can take courses such as Diagnosis and Treatment, Research Methods, and Career and Guidance Counseling. In addition to these courses, students may be required to take part in a practicum, internship, and in-person training sessions. These sessions are required to ensure that students are truly understanding and properly applying information from the curriculum. Online Option: Yes. All classes are available online. In person colloquim and orientation required. Student may have the opportunity to choose from 2 different realms of counseling at Prescott College. This incredible university offers students both the Master of Clinical Mental Health Counseling and Master of Education in School Counseling. Depending on which program you choose, you may have the opportunity to learn more about the different counseling techniques that are relevant to your chosen field. The credit requirement for these programs is 60, allowing this program to be completed in 2 to 3 years for most students. There are some in-person requirements for this program, including an initial orientation and a colloquim once a semester. Some of the course work included in the Master of Clinical Mental Health Counseling is Social Justice in Counseling, Counseling Theory, and Assessments. Online Option: Yes. All classes are available online. Offered in part-time cohort format. The online Master of Clinical Mental Health Counseling at NC State University is a great option for students that are looking for reliability and quality with their degree program. This innovative online program requires that students attend school year-round and in part-time format. Students may also be required to take part in an internship and clinical work experience requirement as part of their degree program. The courses that students might see throughout this program include Techniques in Counseling, Clinical Assessment, and Cross-Cultural Counseling. This university prides itself on its dedication to excellence in providing a diverse learning atmosphere for professionals that can provide diversity advancement in the field of counseling. This entire program can be completed in around 3 years for most students. Online Option: Hybrid. Some courses are offered online. International travel required for this program. Lehigh University currently provides an incredibly diverse Master of Education in International Counseling program for students interested in stretching their expertise to countries all over the world. This program provides coursework in an online setting, as well as the opportunity to engage in counseling practice in Bethlehem or other international locations. Students that enroll in this degree program may be required to spend at least 2 summer sessions overseas, in order to truly indulge in their curriculum. The online courses involved in this 36 credit hour program may include Counseling and Therapeutic Approaches, Culture-Centered Career Intervention, and Education of Individuals with Special Needs. Students that are enrolled full-time may be able to complete this program in around 2 years. Students are required to attend courses and sessions year-round. Online Option: Yes. All classes are available online. Virtual hybrid format also available. CBU currently provides an online Master of Counseling Psychology for individuals that are seeking flexibility with their education. This program is offered in 2 formats, including a completely online option and a virtual hybrid option. Depending on how much support and direct learning you require, either program could be a good fit. Most students enrolled in this degree program can complete it in around 24 months. This counseling program consists of 62 credit hours. The classes that you take may include MFT Counseling Techniques, Human Sexuality, Psychodiagnostics, and Advanced Research Methodology. Like most counseling programs, students may also be required to take part in a practicum experience throughout their program. In addition to the practicum, students may also be required to take part in a supervised work experience prior to working with individuals in the public domain. Online Option: Yes. All classes are available online. Internship and practicum may be required. The online Master of Clinical Rehabilitation and Mental Health Counseling at West Virginia University can provide students with a learning opportunity beyond their own expectations. This program consists of 60 credit hours, all of which can be completed in around 2 years. Students that enroll in this program may be required to attend 2 residencies in Morgantown, West Virginia as part of their degree requirements. The curriculum for this degree program can include concepts from different branches of counseling. The focus on mental health and rehabilitation can help students to gain a better understanding of the challenges faced by people within their community and the methods available for assisting them. Courses for this program may include Crisis, Trauma, and Grief, Ethics, Human Appraisal, and Couples and Family Counseling. Creighton University provides a Master of Science in School Counseling and Preventative Mental Health to students that want to affect more vulnerable groups with their counseling efforts. This program focuses on the need for preventative measures within school systems, so that students can lead happy and normal lives. Students that choose this program can choose from concentrations in Elementary School Counseling, Secondary School Counseling, or PK-12 Guidance Counseling. The curriculum for this program consists of 36 to 39 credit hours, which can be completed in around 2 years for most full-time students. Courses seen throughout this program include Individual and Program Assessment, Action Research, and Diagnosis and Mental Health Issues. In addition to standard coursework, students in this program may also be required to engage in a 600-hour internship before completing their degree. Online Option: Yes. All classes are available online. In-person workshops may be required. San Diego State University provides students with a 30-unit Master of Arts in Counseling program for future career advancement. This innovative and growing school supports trauma-informed care of patients that are dealing with mental illness and promotes further learning in their educational programs. Students that are enrolled full-time may be able to complete this entire degree program within 2 to 2.5 years. The curriculum for this program seeks to teach students more about the different theories and practices approved for implementation in the field of counseling, encourages students to engage in personal growth, and provide students with the diagnostic skills needed to help others within their community. Students in this program may also be required to engage in 2 in-person workshops on campus. Internships and supervised work experiences may also be required.